With Inking Animals, artists of all levels will discover how to use traditional inking and illustration techniques to create whimsical, expressive, and modern animal works of art. Inking Animals guides aspiring illustrators and drawing enthusiasts with a fun, interactive learning experience that demonstrates how to use traditional inking techniques to create whimsical, original illustrations of their favorite animals. This dynamic guide is ideal for beginners, as well as traditional artists who want to explore pen and ink on a more playful level. Talented artist Sova Huová instructs art enthusiasts in drawing, inking, and coloring techniques, in addition to exploring abstraction for expressive artwork, enhancing illustrations digitally with easy-to-follow instruction, and much more. Beginning with an introduction to tools and materials, artists will find helpful tips for working with inks, pens, and even watercolor. Inking Animals features a wide range of creative and fun inking techniques and unique projects that are simple and engaging, while Huová’s valuable tips and tricks, and creative prompts and exercises will encourage artists to experiment and play as they learn. 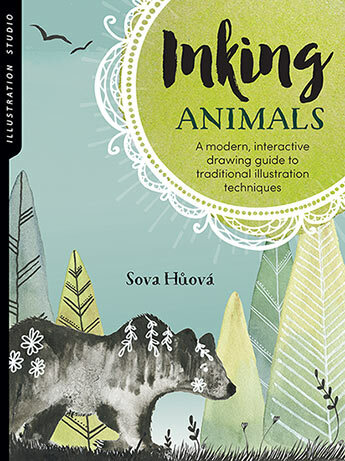 Featuring a variety of creative tips, techniques, exercises, and step-by-step projects, Inking Animals is the perfect resource for pen and ink illustrators of all levels. Sova Huova is an illustrator and art teacher from Prague, Czech Republic. She creates art for children and whimsical illustrations inspired by nature, myths, and folk tales, which she studied at university. She has always wanted to retell these ancient stories for the modern world and now she does so in her paintings. She teaches traditional illustration techniques for beginners in her online classes and art classes for children. Working with kids and their imagination and creativity helped her to get back to art without fear after few years creative break. She loves to inspire people to create their own art and to show that there is nothing to be afraid of. For her illustrations, she uses mostly traditional media like watercolors or ink.